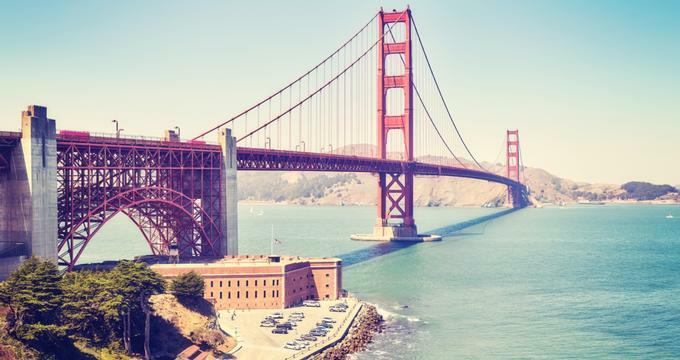 San Francisco is one of those cities where you can eat in a different restaurant every day of your life and still not be sure you have tried them all. While legally you are not supposed to bring your dog inside where the food is prepared, they are allowed in the outdoor area and on decks, patios, and verandas and by sidewalk tables. In some, your pooch will get a bowl of water, while in others, like Zazie, your dog gets treats on Monday while you get a discount on your wine. If your dog is lucky, they might even get to share your sausage, burger, or steak. aina is a rustic-chic Hawaiian restaurant in the hip Dogpatch San Francisco neighborhood known for its inspired brunches and modern Hawaiian menu. 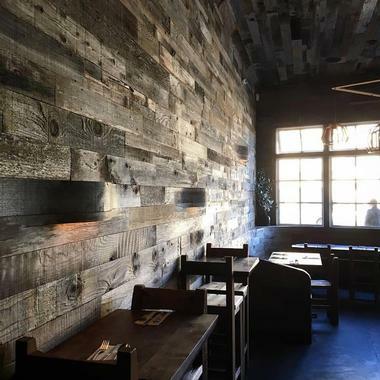 Large communal tables and lots of recycled wood make the place feel social and friendly. 'aina is considered the best Hawaiian restaurant in the city and the island vibe shines through with dishes such as house-made “spam” musubi wrapped in lettuce leaf, malasada doughnuts filled with guava custard, and Binchotan-charred octopus served with kalo coconut cream. There is nothing more tropical than a punch bowl for two with all the trimmings or coconut milk punch with vermouth and hibiscus sugar. 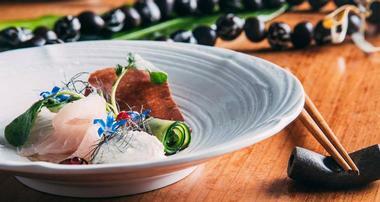 'aina serves dinners from Wednesday to Sunday. Brunches, which are served from Friday to Sunday, bring crowds, so be prepared to wait in line. Occupying the warehouse of a former granite-cutting factory in the quiet, residential Bernal Heights neighborhood, Barebottle Brewing Company is a family and dog-friendly gathering space, brewery, and tap room. You can watch beer made on one side of the vast industrial space filled with large, shiny tanks and barrels while you are sampling their high-quality product. Food comes from one of many visiting food trucks parked outside. The huge communal tables inspire socializing and passionate discussion about which of the brews is the best. The place is very popular, even though it may seem a bit unusual to see so many families, babies, and dogs happily hanging out together in a brewery. 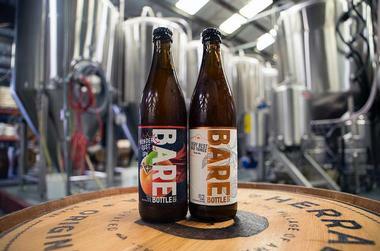 Barebottle hosts a monthly amateur brewing competition. The finalists’ brews are added to the rotating tap menu. Don’t let the dingy hole in the wall look fool you, Bender’s is a beloved Mission neighborhood dive bar, eatery, watering hole, and social club. Every inch of the place is covered with vintage signs, license plates, photos, and who knows what else. The bar is huge, as is the line of beers on tap. The tables are made of old doors and you can spend hours at the pool table or pinball machine. The old jukebox is loaded with punk and heavy metal, normally blasting day and night. There is also a back patio, an extension of the indoor design scheme. The food is delicious pub grub made of sustainably raised meat, line-caught fish, and local and organic vegetables. You can indulge in barbecue burgers, fried pickles, or fried Oreos and your dog will get a treat specially prepared in-house just for pooches. Located in San Francisco’s Hayes Valley neighborhood, Chez Manan West on Gough Street Is one of the two charming Chez Maman Parisian-style bistros serving French delicacies such as baked camembert and escargot de Bourgogne and incredible crepes. 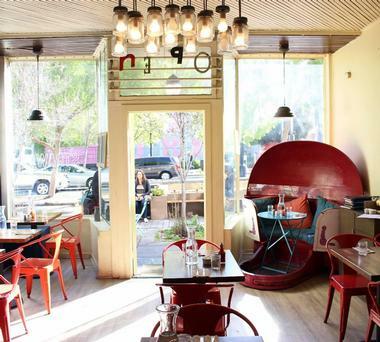 The Hayes Valley location greets guests with fun red-stripped awning, red banquettes, and typical, small bistro tables. On the wall behind the large granite and copper bar is a blackboard with daily specials, food, and drinks. What is available every day is home-made sangria, 20 red and 20 white wines, margaritas, and Bloody Marys. There is a nice little sidewalk patio where you can enjoy your meal while people watching and sharing your goodies with your four-legged best friend. 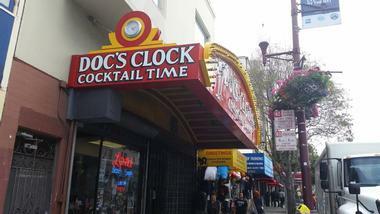 After the closure of the beloved Mission dive Doc’s Clock caused outcry in the city, the bar reopened just a couple of blocks down the street. It is pretty much the same as before: Narrow and tight with booths in the back, art on the walls, and the same old bar. They even brought along the old shuffleboard table, arcade games, and jukebox. The drinks are still cheap and plentiful, the beer selection is huge, the cocktails are imaginative, the crowds are elbow to elbow, and the dogs are welcome. What more can one want from a neighborhood dive bar? 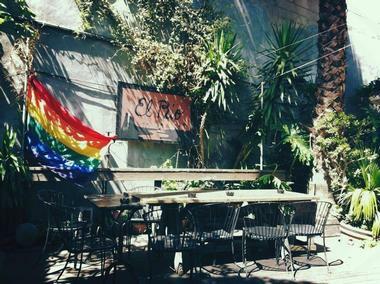 Located on Mission Street in San Francisco’s Bernal Heights, El Rio has been a favorite neighborhood dive bar since 1978 and is one of the few places in the city with a really wonderful, large outdoor patio. El Rio is fun, kitschy, and overdressed, with hidden nooks and crannies where you can snuggle with your darling. It offers live music, karaoke, cheap beers, and a fantastic Bacon Bloody Mary. You can bring your friends, your mom, or your dog and you can dance or play ping pong. There is also a pool table, dice games, and shuffleboard. Or you can just sit, sip your cold brew, and watch the crowds. Anything goes at El Rio. Hidden in an alleyway off San Francisco’s Union Square, Hops and Hominy is an understated, homey Southern restaurant with rustic, unadorned brick walls and large communal tables made of reclaimed old pinot noir barrels, where aficionados of authentic coastal Southern cuisine enjoy artery-clogging delights. There are fried oysters, shrimp and grits in tomato-brandy sauce, and crispy country-fried steak. They can all be washed down with one of eight craft beers on tap or incredible cocktails, such as the Smoked Bacon Manhattan. 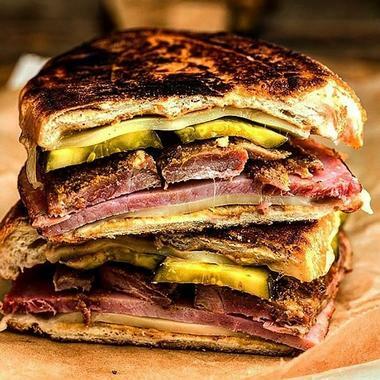 There is nothing missing: There is crocodile steak, cornbread and black-eyed pea fritters, rabbit tortellini, po’boys of all kinds, and just about anything else lovers of Southern cuisine crave. They even have a dog-friendly patio. Kitchen Story is a popular family breakfast and brunch place in San Francisco’s Castro District in Eureka Valley, where California cuisine meets Asian influence and you can get dishes you won’t find anywhere else. 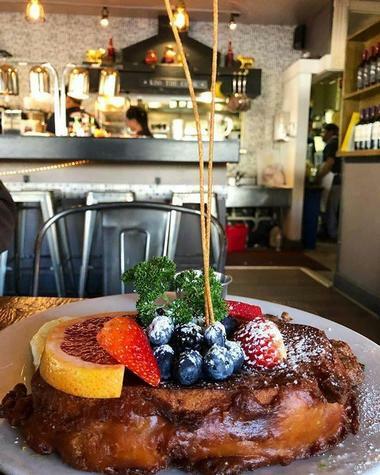 Their bacon is sprinkled with pepper, cayenne, and brown sugar, served with organic grilled asparagus and maple syrup sauce, while the French toast is a delightful mountain of bread and fruits and stuffed with mascarpone cheese. The place looks small, with long communal tables and banquettes, but it has a line of tables on the sidewalk for people watching and sharing your breakfast with your four-legged best friend. There is always a water bowl for the doggies. You can wash down your breakfast with fixed-price bottomless mimosas. 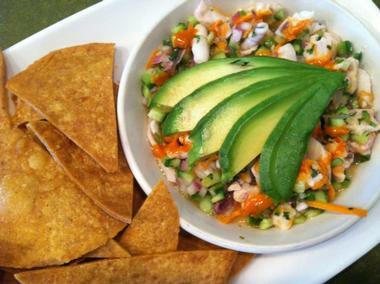 Located in Inner Sunset near the San Francisco Panhandle, Nopalito is a popular Mexican restaurant that offers traditional dishes using fresh, organic ingredients sourced from the surrounding areas. If you come with a bunch of friends, start with a platter of blue corn tacos filled with spicy-smoky marinated fish and served with a pitcher of margaritas. Then proceed with their fabulous carnitas or colorful ensaladas de nopales and definitely finish with the vanilla bean flan with orange-caramel sauce or their fantastic orange supremes. While you indulge in their rich assortment of tequilas, let the kids enjoy house-made horchata. If you come with your pooch, sit in their cozy outdoor space, perfect for people watching. Nopalito has another location on 9th Avenue. 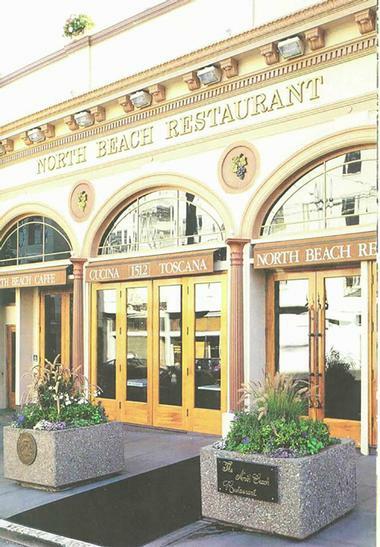 One of the most popular North Beach restaurants for special occasions or a romantic evening, North Beach Restaurant is elegant and chic, with Florentine floor tiles, Venetian granite, Carrara marble, hand-made cherrywood paneling, and magnificent vaulted ceilings. 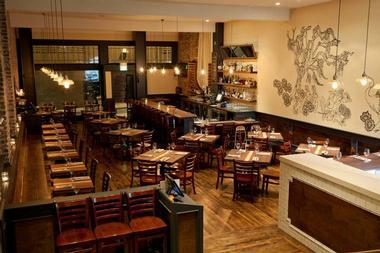 White tablecloths, original paintings on the walls, and formally dressed waiters add to the elegant atmosphere. The food is authentically Tuscan and the wines are local, from the owner’s vineyard. The menu is large and diverse and has something for everyone. Before ordering, check out the chef's daily specials. North Beach is dog-friendly on their outdoor patio. Besides the main dining room, North Beach has three private dining rooms for special occasions. Outerlands is a cozy place in the foggy Sunset Beach neighborhood of San Francisco, popular for its fabulous breakfasts and brunch. The small place is covered in recycled wood, while the small tables are packed in the morning but get a bit more relaxed during the day. People come for their great locally roasted coffee, freshly baked pastries, and in-house baked bread. Their Dutch cast iron skillet-baked pancakes will spoil you for all other pancakes forever. 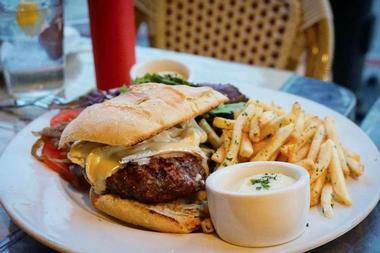 While the breakfast is all the rave, Outlanders has great dishes for lunch and dinner as well. Nothing earth-shattering, just everyone’s good old favorites done right. 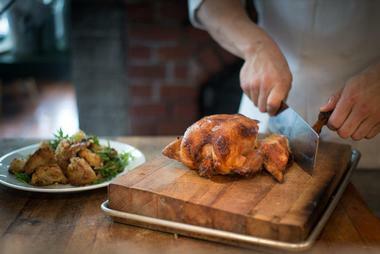 Try the smoked chicken with charred gem lettuce and tomato panzanella. There are tables outside on the sidewalk where you can bring your pooch. Park Chalet Coastal Beer Garden has a dream location – in the heart of San Francisco’s Golden Gate Park, so do not be surprised by the crowds. It is located within the park’s visitors center, not far from the beautiful Dutch Tulip Garden and Queen Wilhelmina's Windmill. The dining room/tap room is like a greenhouse, with a glass ceiling, a lovely stone fireplace, and a retractable glass door that opens up to a large, well-tended lawn with comfortable chairs. You can also just throw out your blanket. They serve their own beer from six taps and two rotating taps, and the food is fabulous. Try the house-smoked pork rib with achiote rub, cumin-roasted cashews, guava barbeque sauce, and cilantro or their famous ocean rolls with lobster, shrimp, or crab. There is regular live music by local bands. Dogs are welcome. 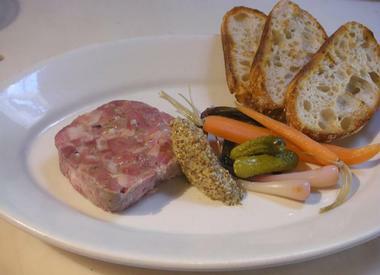 Plouf is French bistro in the lively and touristy Belden Alley in San Francisco’s Financial District. The French bistro vibe starts with the large awning and tables lined on the sidewalk, just like in Paris. 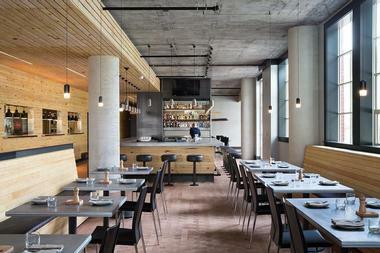 The industrial-chic decor inside does not detract from the Parisian vibe, with its fireplace and white tablecloths. The menu mostly focuses on seafood and there is no dish that would not delight you. Mussels are the most popular choice. Try them in curry sauce, served with crunchy bread for dipping. The spicy crab cakes are also fabulous, and the pastis flamed shrimps served with polenta are rich and buttery. They serve nice cocktails, a great selection of beers, and a solid list of red and white wines. Dogs are welcome in the outside area. Red Dog Restaurant and Bar is large 120-seat restaurant in the SoMa district of San Francisco, sleek and modern and full of light. Chef Lauren Kiino offers inventive Northern California fresh farmhouse cuisine made of local, seasonal ingredients. Try Red Dog’s signature crispy pork trotter burger with pickled red cabbage. Lunch focuses on sandwiches, soups, and salads and you can eat in or take them with you. They are really user-friendly. For dinner you can get really nice half-roasted chicken with spring onions, served with charred bread pudding, and you can spend some time with friends watching a game on TV. Everything goes at Red Dog, as long as it makes guests happy. 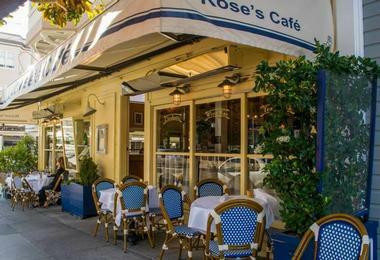 Rose's Cafe is a quaint, cozy, and crowded neighborhood trattoria in San Francisco’s Cow Hollow neighborhood. It has an incredible brunch menu that actually works for breakfast and lunch as well. The menu changes daily and everything is made fresh from local growers and producers using seasonal ingredients. Their breads, focaccia, pizza dough, pastries, jams, sorbets, ice creams, and desserts are made from scratch onsite daily. Much of their food comes from a wood-burning oven and the breakfast pizza is by far the most popular dish. It comes with arugula, egg, or prosciutto. There is also a hot hero sandwich, warm rice pudding served with pears, orange currant scones, and hand-made pasta, so there’s something for everyone. The outdoor tables are wonderful on a warm day and you can bring your dog as well. 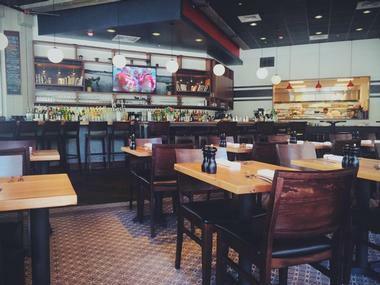 Located in the Presidio's Letterman Digital Arts complex, Sessions at the Presidio is modern, spacious gastro-pub with an industrial vibe and more than 100 craft beers on tap and in bottles. The surrounding greenery provides a lovely background for the mostly unadorned space. 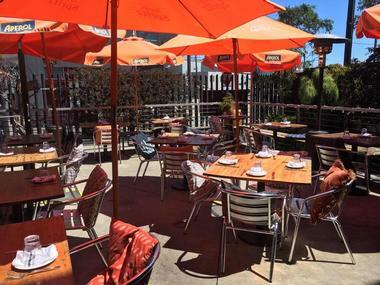 The pleasant, trellised 50-seat outdoor deck has a view of the Golden Gate Bridge and allows dog owners to enjoy their brews and delicious munchies in the company of their four-legged best friends. Kids are allowed too. Sessions focuses on low-octane brews, mostly from artisanal breweries that produce small batches. Wines and good cocktails are also available. Food is not an afterthought at Sessions. It is imaginative and seasonal and the menu changes frequently. The ingredients come from Marin's Skywalker Ranch and you can expect such treats as Saltspring Island mussels in Laughing Monk Witbier with apples, bacon, thyme, and grilled bread. 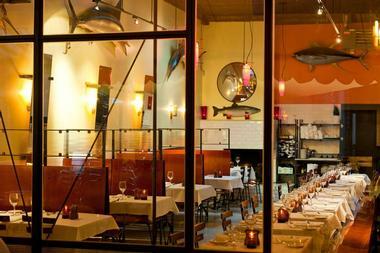 Skool is a popular Potrero seafood place with an interesting fusion of Asian and pure San Francisco. The huge dining room features a stunning industrial-chic design with very little décor and is popular with the hip crowd. The best place to sit is the cozy, pleasant outdoor deck, where you can bring your dog, both during the day and in the evening. The vaguely Japanese menu of Executive Chef Toshihiro Nagano has exquisite imaginative dishes such as monkfish liver mousse, Japanese fried chicken with waffles, and Dungeness crab-filled deviled eggs. The wine list is extensive and the cocktails are fun and plentiful. 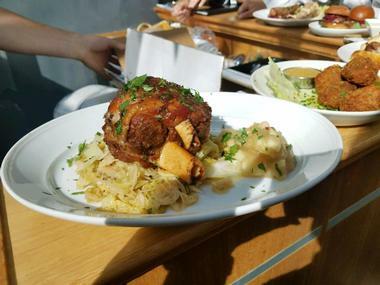 Straw is a small, quirky eatery in San Francisco’s Hayes Valley neighborhood serving nostalgic carnival-inspired dishes. The décor is in the same tone, with large posters of old-fashioned American travelling carnie scenes, a Tilt-A-Whirl booth, and more. The dishes are delicious comfort food such as The Ringmaster, their famous donut burger with two all-beef patties with American cheese between two house-made glazed donuts, served with a pile of shoestring fries. The drinks are also carnival-inspired, mixing booze with candy, such as the Big Dipper with vodka, strawberry, lemonade, and basil. There are a few tables outside where you can bring your dog and enjoy a spot of people watching. 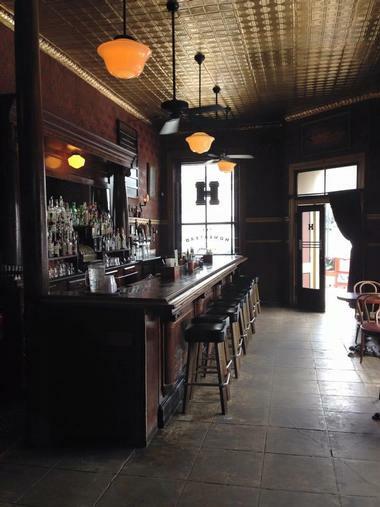 The Homestead is a very popular prohibition-style neighborhood bar in San Francisco’s Mission District, an old-fashioned dive located in a lovely, ornate Victorian house. The atmosphere is fun and lively, and the style is torn between a Victorian parlor with Victorian-style wallpaper, press-tin ceiling, and large paintings of nudes, and a Wild West saloon with peanut shells crunching under customers’ feet and a cozy fireplace that attracts snuggles. The huge selection of whiskies and bourbons keeps everyone in a mellow mood. The large gleaming bar has a lovely old cash register among the myriad of colorful bottles, and the bartender knows how to make a really good Old Fashioned. Understandably, the place is permanently packed. The dogs are allowed, or at least can hide in the low light. Toronado is an old-fashioned San Francisco bar, the kind that does not open any more. Dark, packed elbow-to-elbow, with no cozy seats or decorative gimmicks, Toronado is all about the beer. Part of history as the forefront of the 80s craft beer movement, Toronado is a beer-aficionado’s heaven. 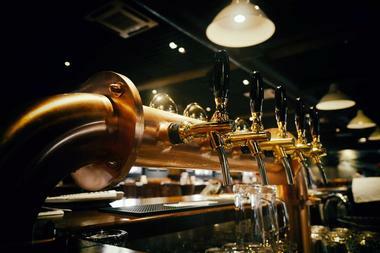 It offers 45 rotating beers on tap, with an ever-changing board above the bar showing what is available. Toronado specializes in California beer, but you will also find some brews from the East Coast, Colorado, and Belgium. If you get hungry, go next door to Rosamunde for a sausage sandwich. You can bring your dog to Toronado, but keep them close and make sure nobody falls over them or the bouncer will send you packing. Universal Café is a small, unpretentious neighborhood eatery in the Mission District, a perfect place for a quiet, quick, and delicious brunch from Wednesday to Sunday and dinner Monday to Friday. Chef/owner Leslie Car Avalos produces culinary delights made with fresh ingredients such as braised oxtail with spicy greens and fried eggs or scrambled eggs with white cheddar and spinach. The menu is constantly changing depending on the season. You can sit at the counter and watch the chef doing her magic in the open kitchen. Outside tables are always full on a warm day. Dogs are welcome. 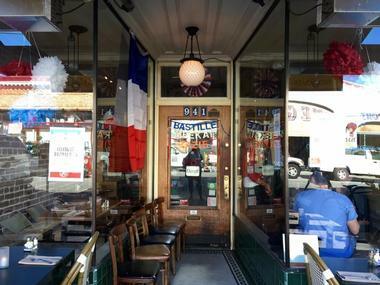 Only a few blocks from Golden Gate Park and Haight Street in the idyllic San Francisco Cole Valley, Zazie is a charming French bistro that has been neighborhood favorite since 1992. Specializing in classic American-style brunches and exquisite Provençal dinners, Zazie is a popular destination for neighbors and tourists alike. If you want to try their famous croque monsieur, gingerbread pancakes, or chicken-apple sausage for brunch, be prepared to wait in a long line. Zazie’s indoor atmosphere is charming and unpretentious, with exposed brick, small bistro tables, and comfortable banquettes along one wall. The outside porch is everyone’s favorite on a warm, sunny day. Monday nights are special Dog Nights, and if you bring your dog, they will get treats and while get $10 off your bottle of wine. Located in the Civic Center in San Francisco’s Hayes Valley district, Zuni Cafe is an iconic Mediterranean restaurant that has been the city’s favorite since 1979. The large, always buzzing two-story space, stylish and comfortable furniture, gleaming copper bar, and tantalizing aroma of goodies baked in the wood-fired oven create a great background for a memorable meal. The menu changes daily depending on the availability of fresh, local, and seasonal ingredients. It is large and diverse and ranges from the huge raw bar and mouth-watering fire-oven baked chicken for two and superb pizzas to a salad of sliced persimmon with baby arugula and shaved Jerusalem artichoke and their famous burger on focaccia. Zuni features biannual art exhibitions of Bay Area artists on its walls in collaboration with the city’s art galleries. Dogs are welcome in the cozy outside space, where the full menu is available.